Interesting article on the Junius on UKIP blog. Monckton is now UKIP's deputy leader. 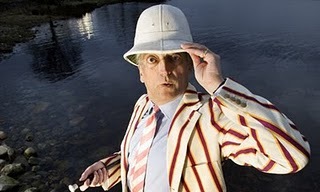 Christopher Monckton has said that his was a life in lonely dedication to Truth - that thing, he says, that never changes no matter how many lies are told. He should really learn to practice what he preaches. Monckton makes David Bannerman look like an amateur when it comes to telling lies. He claims to be a science expert. This is despite the fact that his paper-thin educational background lies in the Classics and his single academic credit is a diploma in journalism. In 2006 Monckton sent a letter to U.S. Senators Olympia Snowe and John D. Rockefeller. Finally, you may wonder why it is that a member of the Upper House of the United Kingdom legislature, wholly unconnected with and unpaid by the corporation that is the victim of your lamentable letter, should take the unusual step of calling upon you as members of the Upper House of the United States legislature either to withdraw what you have written or resign your sinecures. But perhaps he didn’t notice. Or did he just forgot? Monckton is best known for his lectures on climate change. At the start of these talks he is introduced as ‘Lord Monckton’. He even uses the emblem of Parliament, the Crowned Portcullis, on his PowerPoint slides. A quick call to the House of Lords will confirm that Christopher Monckton is not and has never been a Member of the House of Lords. There is no such thing as a “non-voting” or “honorary” member. Christopher Monckton's father, the 2nd Viscount Monckton, was a Member of the Lords until 1999. The House of Lords Act 1999 ended the automatic link between the holding of a hereditary peerage and membership of the House of Lords, and the 2nd Lord Monckton ceased to be a member of the House at that point. The House symbol is primarily used to authenticate communications from Members. Further background information can found in The Portcullis. We sincerely hope that Monckton has not appropriated the symbol of the House for purposes "where there is a risk that their use might wrongly be regarded, or represented, as having the authority of the House". Monckton also makes ridiculous claims on other topics, such as that a ban of DDT was singlehandedly responsible for all malaria deaths in the last few decades, or that the best way to have solved the AIDS crisis was to imprison all AIDS sufferers until they died. Monckton says that he is the author of a 1200-word article for the Daily Telegraph on the reasons in international law why the Falkland Islands are British. It was supposedly read out on the BBC World Service's Argentinian broadcasts every 20 minutes during the Falklands War. But the BBC World Service deny this. They don't have an Argentinian service, and have never made specifically Argentinian broadcasts. Monckton has said that he has won the Nobel Prize. In 2007 Nobel committee awarded the 2007 Peace Prize to Al Gore and the Intergovernmental Panel on Climate Change (IPCC) "for their efforts to build up and disseminate greater knowledge about man-made climate change, and to lay the foundations for the measures that are needed to counteract such change". Monckton claimed to also be a Nobel winner because he had done such good work trying to undermine their effort. Monckton claimed that he deserved the accolade because he was a "reviewer" of the IPCC report. Monckton said he also deserved a Nobel Prize because he wrote a letter pointing out a decimal point typo in one table of one IPCC report, making him a “contributor to the IPCC”. The IPCC accepts reviews, unsolicited, and actually invites reviews from people who have varied perspectives, scientific and otherwise. But that doesn’t mean they can claim to be a Nobel Laureate! The Nobel Committee were less than impressed with Monckton. Committee secretary Geir Lundestat had never heard of Lord Monckton. No individual, no matter what their involvement with the IPCC, can pass themselves off as a Nobel Laureate. And Monckton’s Nobel Prize pin? The admission was made several hours after he had said on a radio program that he had been awarded the Nobel - a claim that the interviewer did not question. His contribution to the IPCC's Fourth Assessment Report in 2007 - the correction of a table inserted by IPCC bureaucrats that had overstated tenfold the observed contribution of the Greenland and West Antarctic ice sheets to sea-level rise - earned him the status of Nobel Peace Laureate. His Nobel prize pin, made of gold recovered from a physics experiment, was presented to him by the Emeritus Professor of Physics at the University of Rochester, New York, USA. And this is the man now being touted as UKIP’s next leader! A serial liar as a political leader? He should feel right at home! So now you know the truth. But will that disturb those UKIP lovers of Truth who still think that Monckton should succeed Pearson? just a piece of information that is a little more fascinating than this; The 7th Lord Lucan (yes he of the dissappearing act) has a son called George who can perfectly legally style himself as the 8th Lord Lucan, yet cannot take his place in the Lords as no death certificate has been issued despite the fact he has been declared dead for reasons of Probate, Insurance and absense. Lucky Lucan's wife was Veronica as I recall and her brother in law helped her get the various clearances Veronica's sister had married Shand Kydd. Veronica never got on with Aspell, Goldsmith and the rest of Johnny's gambling set. The only prominent one left now is Stuart Wheeler that I can think of but Stuart was a year behind him at Eton but Johnny was in Toffs as I recall Stuart wasn't. John Bingham was in my opinion an honourable man and I believe he acted honourably - he was a great gambler but he would not have Welched onn this gamble that went wrong. He knew you couldn't walk away from a bad hand and you can't beat the flop! I don't think anyone cares if Cristopher Monkton calls himself by his rightful title as Lord Monkton it is that he seeks to 'pass himself off' as Christopher Monkton member of The House of Lords which is not nor ever has been. A very servile attempt at discrediting a man who has the United Kingdoms interests at heart. Not content to pay his carbon taxes to the Bilderberg Oligarchy or to see millions starving as a result of rising food prices caused by biofuels he has made a very lonely stand against a very ruthless and determined special interest. If anyone wants to believe the Nobel prize has not been hi-jacked by the oligarchy then let them believe that Barry Soetoro (obama) did not send more american troops to afganistan after recieving his "peace" prize. get real - it isn't a lonely stand many of us have been telling the truth for years. Christopher Monkton has brought the warmists a gift - he lies about who he he then lifts his material from people like Richard North and Watts Up etc. he NEVER gives credits. He sticks the HoL portcullis all over his slides etc. He is NOT a member of the HoLs he is a fraud which undermines his stancce. Have you read his paper on his cure for Influenza? Or the one he has on HIV/AIDS. What is ridiculous is when UKIP fields ANOTHER clown and then get all precious when whe laugh at the joke! He is a politition and journalist not a scientist , ofcourse like the rest of us , his opinions are formed from the work of scientists. He has simply brought more light on issues that have been very much in the dark. If his non-attandance in the lords is to discredit "climate change sceptics" then it is only becasue people like yourself are bringing attention to a very minute and unimportant detail. Hardly a hanging offence is it. It does seem that Lord Moncton sells himself rather , this is needed though especially in the states where people dont understand the finer details of british politics and like to see something solid before them , americans have a short attention span , they would be asleep by the time he got to the bit where "inhereted peers may no longer take their place in the Lords unless elected by corrupt special interest"
I guess the special interest dont want him in the lords and that looks good for him. do some homework Christopher Monkton is an habitual liar and cheat. I will do a blog for you in the next few days and show just what a dishonest little creep he is - I'm a bit under time pressure but it will give you all the proof you need of his serial dishonesty. He is certainly connected with 1 or 2 institutes that appear to receive Exxon Mobil cash. Exxon, Mobil, BP, Shell and the like are some of the biggest donors to the Green movement around the world. Whether they buy the total crap about anthropogenic global warming or not I very much doubt. With the rigor of the science in the IPCC report and the Warmist Religious Cult we would still be living in caves and Shell, BP, Mobil, Exxon and the like would still be trying to licht fires with flints! Clearly the Warmist cult is founded on the most enormous pile of self interest based on money and taxation. There is clearly so little substantive fact to back the argument it is scarey. However just think howmany people still believe creationist clap trap and worship various gods they have invented! Mamon & Power being not least of these! There is little doubt that Monckton is a fraud wherever he gets his funding! YouTube - Bill Gates EXPOSED! Wants Depopulation Through Vaccines! can any of you NWO worshipers answer what aids has got to do with population control unless it was released on purpose? Should the W.H.O the world eugenics organisation not deal with that. I agree that drug users shouldnt reproduce while using. But they this will be extended to alcoholics , then the mentally ill and then whoever the police or council deem to be mentally ill , ie anyone who falls out with a social worker or won't pay a bribe. no it isn't something that doesn't happen in the uk.